The goal of Brandon C. Smith’s and Travis Townsend’s fifth installation project was to connect our own individual artistic vocabularies to create a visually engaging environment that is both meaningful (with many open-ended associations and metaphors) and a manifestation of the collaborative creative process itself. 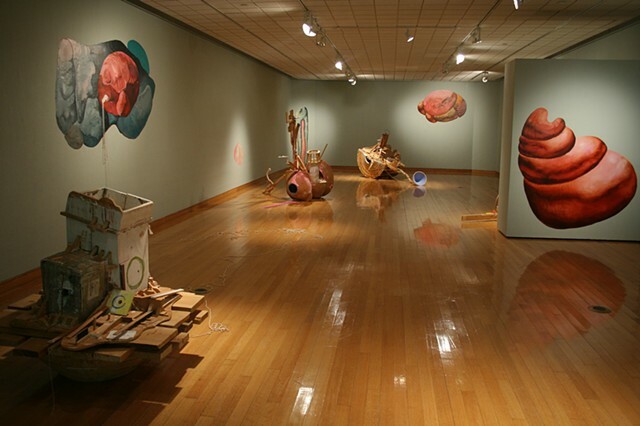 Smith paints a landscape of proliferating clouds and potentially infectious biomorphic pods, while Townsend builds wooden boat-like contraptions that seemingly travel, lurch, and float towards (or is it away from?) the large painterly meat bags. These slightly inhabited vessels appear to be seeking out, or purposely avoiding, something big, strange, and powerful. Perhaps they are caught in the midst of this environment while attempting to find a navigable and meaningful path.